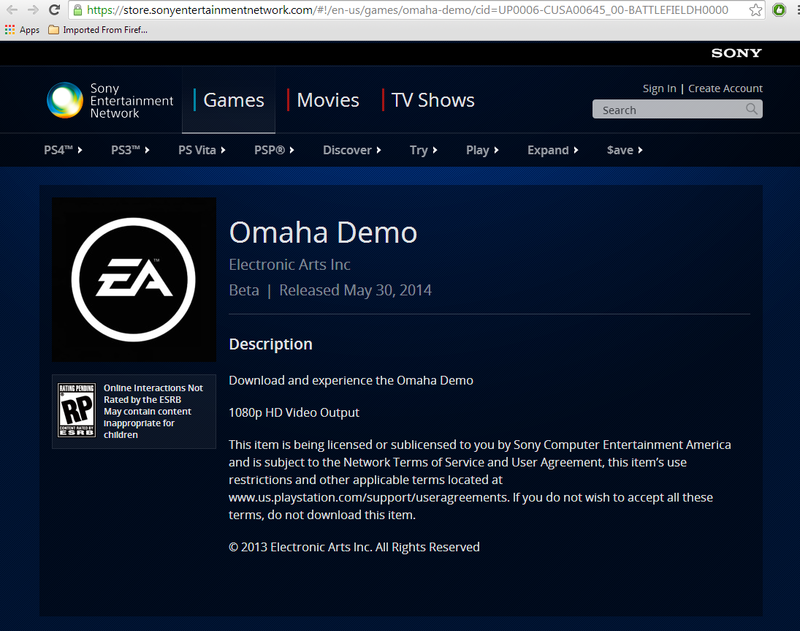 Battlefield: Hardline PS4 beta commencing after E3? I'm so glad I signed up for the theater experience! I wonder if EA is doing this for money or for the (bigger) install base? So many beta testing jokes to make... so little time. The Battlefield 4 beta on PS4 is still going strong, so this seems to be following in that game's footsteps. So I guess Hardline will have a big presence at Sonys show? Or will every platform be getting Beta keys? Still cant say I really care for it yet. I come to BF for big player counts, stuff blowing up and not being able to fly a helicopter. Still not sure Hardline will deliver these things. As it should be not 3 weeks before launch that isn't a beta at all just a glorified demo. I received this email too!!! Omaha beta is mine!! hahahahahaha!!!! Doubtful, aren't EA and MS still spooning? I wouldn't mind getting in on this. Looks like it's definitely happening. DAMN SONY AND THEIR MONEYHATS!! Wait what? Are they going out? If memory recalls, didn't the ps3 get an exclusive Arica Harbour beta last gen? Was the BF4 beta timed (or not timed) platform exclusive? I bought BF4 Premium day 1, I'll be salty as hell if I don't get in to beta somehow. Wait why are people already getting invitations? Is it a mistake? I have a feeling this E3 will be full of Beta access games. Yeah, it is. Its suppose to go out when E3 conference finishes. Interested. I wonder if it will be invite only, open, or open with preorders. Here's a thought: seeing that it's referred to as the "Omaha Beta", what if different locations receive different betas for different games? The first of many E3 demos? Anyway, I hope I get beta access after buying BF4 premium. I got the email for the beta. Release date will be October 28 along with Assassins Creed. You know it's true. 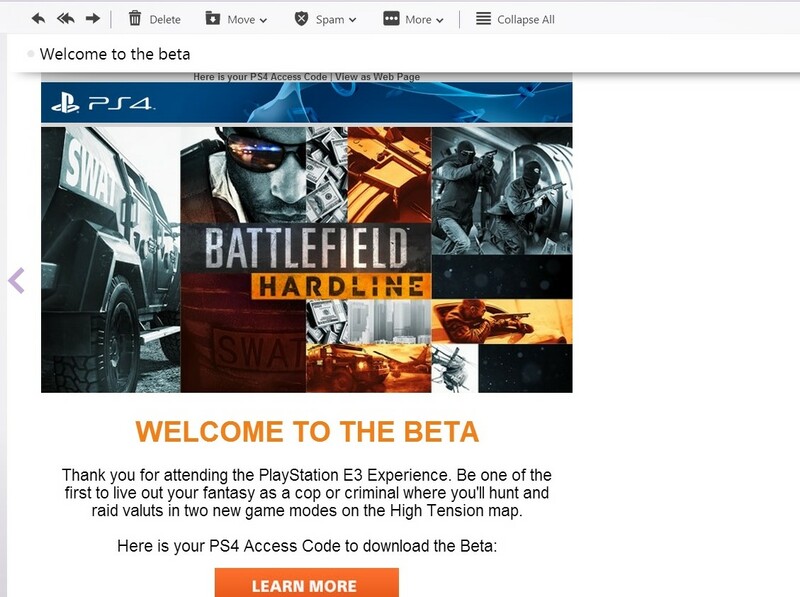 I got in the Hardline Beta, YES! Any idea on how you got in? Welp, there goes my theory. Either way, I am cautiously optimistic about this, given the performance of Battlefield 4. How can we apply for the Beta? I want Uncharted 4 MP beta. No clue, I didn't even get premium for BF4. Good question, I wonder as well. Also, I don't believe these codes are generated yet, so it just goes to a blank page? Yeah I see a whole bunch of "buy this HD collection to get into the beta for the game you actually want" coming. Might be a Madden 15 demo instead with Peyton Manning and the Broncos as one of two playable teams. Wonder if it's a co-marketing deal or just EA "listening to their fans" like Microsoft. It just sends me to the Playstation main site. So no $60 fee for the beta this year?